3 Why haven't we done this already? 6 How could these additional search results be displayed? The Discovery department is looking into the ability to provide search results from other Wikimedia projects within the same language (commonly named cross-wiki or inter-wiki searches). For example, if you were on the French Wikivoyage and searched for "milk" you would be presented with the expected matching articles from the French Wikipedia and results from other French Wikimedia projects (i.e. : fr.wiktionary and fr.wikiquote). This page is an attempt to summarize some of our thoughts and we invite all contributors to openly discuss this potential change on the talk page. This idea is different, but related to, a new feature that the Discovery Search team enabled in 2016. That new feature shows results from select other language Wikipedia's when it's been determined that the user might have used a different language to type in their query, because their local results are less than 2 matches. The topic of this page - a new display of search results across the same language wiki projects - will be in addition to the new feature of language detection, not replacing it. The way search currently works for all Wikimedia projects is this: each language project has its own separate index to search in. 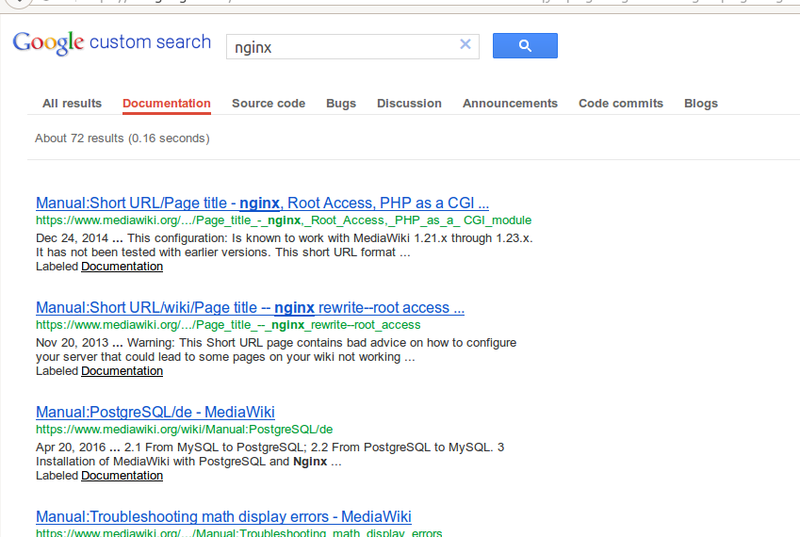 This means that there is currently no way to search across all wiki projects for relevant results at the same time. However, on the backend, the language is the same for a search (regardless of project) and visitors may be interested in information that could be in a sister project in their language. Providing search results across projects (within the same language) provides more information to visitors, easier visibility into other projects, and increases the value Wikimedia visitors receive out of searching on-wiki, which includes the potential for less zero result searches. Displaying additional search results across projects will not only increase visibility to those other sister projects but it could also increase discovery into more articles of interest and possibly even encouraging additional contributions. Why haven't we done this already? Why not have one giant index to search across all projects in all languages? Technical complexity is one reason: the size of the resulting index would be in the hundreds of gigabytes. For example, the English Wikipedia database index of all article pages is around 200 gigabytes. Providing search results quickly would be negatively impacted if having just one very large database index. Another reason for this 'one language' search results approach is that it probably wouldn't be very useful to search for a topic across all languages. Searching for "Paris, France" and seeing generally the same article in French, German, and English wouldn't help very much in discovering new information. This might impact various existing wiki workflows by displaying additional search results. This could possibly affect bots, contributors, researchers, readers, etc. How could these additional search results be displayed? Example of a wiki page with an addition of a listing of article links for sister projects that might be of interest and is related to the original search (also, a history of the page). Please provide your feedback now! Two quarters are needed, at a minimum, to architect and design the technical implementation. The team would like to have something to test and to show to the community sometime in late 2016. We've decided on the mocks in Cross-wiki Search Result Improvements/Testing that will be tested in the first quarter of 2017. How do we want these new, additional, relevant search results to be displayed? Should the results from whatever wiki you're on to be shown first and then have an option to show more from other wikis? Should the additional results be inter-mixed with the local wiki results? Should the additional results be displayed off to the side (or maybe the bottom) of the results page? Should we have the option to turn off these other relevant search results (a user and/or project opt-out)? This could also be similar to the local: keyword that will only search for images on the local wiki and not Commons files, for instance. Would the additional results be best displayed as a list or a grid design? Should we include relevant metadata (images and/or a short description) with the search results? Do the results need to have the size of the article (i.e. : 848 bytes (104 words)) and the date it was created/modified? Should we indicate that clicking on a result will take you to another wiki project? How many results from other wikis should we show - 1, 2, 3, or more? Should we limit the existing method of displaying results from the wiki that you searched on? We currently show up to 10,000 results in a paginated manner, but testing shows that generally only the first 3 results are ever acted upon. Do we want these new search results to work across all Wikimedia projects? For example, if I'm on Wikiquote, do I want to also see relevant search results from Wikivoyage, Wikipedia or Wikinews? Or, if I'm on Wikipedia, just show me results from other projects? Would these other relevant search results be useful and encourage deeper exploration into various topics? Is it annoying to see the other wiki search results? Conversely, does it encourage a user to discover more knowledge? How much weight do we give results from other wiki projects in the results? Will the display of the additional search results from other wikis encourage contributions from editors? i.e. : if you search for Piazza del Duomo and don't see a Wikivoyage article about it (while I'm searching on Wikiquote), would that encourage you to start an article for it? Should we limit the amount of languages we search in? i.e. : only use the top 50 languages to implement this in? Or, only use the languages that we are detecting queries in an other language than the wiki the user is on? After taking into account community feedback and design team recommendations, we'll start A/B testing soon. View this page for more information. Cross-wiki Search Result Improvements is maintained by the Discovery department. This page was created to encourage users to do their own testing, via a self-guided testing page with examples for those not-so-technical and those that have a Wikipedia account and are a little more experienced. This page was last edited on 16 September 2018, at 06:00.